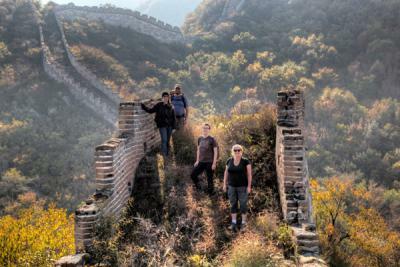 This unique tour offers you two memorable experiences on the Great Wall. 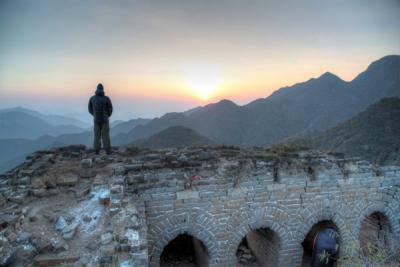 The early morning hike along the Great Wall on top of the mountain range gives you breathtaking views in relative isolation, while spending the night just by the Great Wall under the evening stars – is a once-in-a-lifetime opportunity not to be missed! CCC chooses one peaceful section of the Great Wall near the border of Beijing, which is less touristy, more natural and "wild". The portion of the Great Wall was built around mid 16th century during the Ming Dynasty and acted as a key military stronghold. 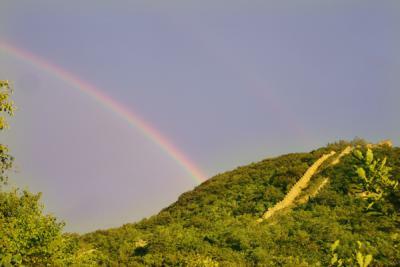 The Great Wall snakes its way through fantastic natural scenery in the mountains. Many watchtowers dot this part of the Great Wall, from which you can see the capital city on clear days. The Wall is very steep and rocky with loose stones at times, but the views it provides are spectacular. During our hike, we’ll also spend some time walking on the mountain road so you can get a glimpse of the villages, farmland, and fruit trees that surround this part of the Wall. Kids age: This trip is suitable for kids at least 6 years old and above, who are able to hike 2-3 hours along the steep mountain path up to the top of the wall. RMB 1200 / RMB 950 for children aged 6-11. (Payment should be made at least three days ahead of departure. Last minute booking, please call CCC directly). * Departure requires a minimum of 6 persons, and the tour group limited to 20 people. 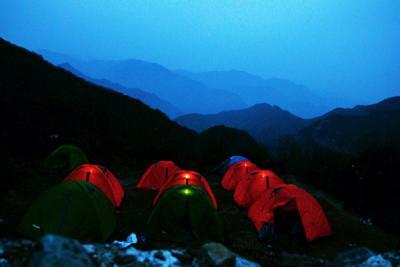 Please note that CCC is only responsible to carry the camping gear (including sleeping bag, mattress and rain-proof carpet) and and breakfast up onto the Great Wall, you will have to carry your personal belongings, drinking water and personal stuuf (porter services are available for a charge of RMB100 per piece for one way. Meet at CCC to catch the coach, and we' ll begin our adventure in the afternoon with a 2 hour drive from Beijing center to the Great Wall near the border of Beijing. Arrive at a village at the foot of the Great Wall. When we arrive at the destination, the porters have already carried up our camping equipments and food up there. We begin to set up the camps. You will scale the wall and be awed by the beauty of the sun setting against the back drop of the one of the seven wonders of the world. Dinner including barbecue and beer on the wall while watching the sunset. Sleep overnight by the Great Wall. Wake up to the splendor of the sunrise of the wall. This is the best time to take pictures. Enjoy a simple western breakfast (bread & coffee)before venturing on your hike on the wall (10km – approx 3.5 hours medium difficultly with ups and downs and some loose rocks). Options: If you do not want to participate in the full hike please tell your guide and he will make arrangements for you to go down the mountain and walk around in the village. Join a local famer family for lunch. Warning: There is no electricity, running water or toilets on the Great Wall. 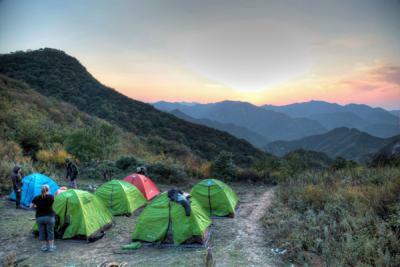 Accommodation beside the Great Wall on top of the mountain, including tents,bedding/ sleeping bags and pillows. (two persons sharing one tent). Tents for 3 persons are available, please let us know at the time of booking if your group of three would like to share one tent. Meals (Barbeuqe dinner on day one on top of the Great Wall and lunch on day two, and one simple Western breakfast (bread &coffee) on the Wall. Some bottles of mineral water, hot water, tea, coffee, beer and other soft drinks. Clean and air-conditioned coach transportation. In case of bad weather--- When it rains or the weather is otherwise hazardous, alternative overnight accommodation will be provided, and the second day' s itinerary will be adjusted according to safety risks. Besides, local authorities sometimes order people off the Wall. If this happens once we have already arrived – and therefore cannot change the tour date – we'll arrange for you to stay in a courtyard hotel at the base of the Wall free of charge. 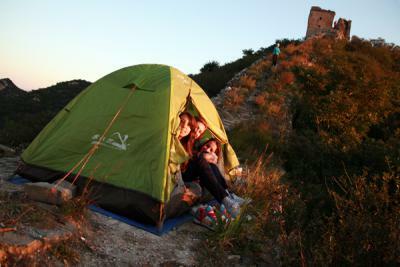 Camping on the great wall may be temporarily suspended during some sensitive political events. Thus we may have to cancel or reschedule the dates in the last minute!. Because winter season will be (very!) cold on the Wall, we' ll stay in a courtyard hotel at the foot of the mountain, but we’ll still enjoy the night sky and sunrise from the Wall. We will purchase an insurance plan for those who don't have international insurance while in China. Please let us know your personal details (full name, passport number, and date of birth) by 12 noon one day prior to depature date if you are interested. Should you not subscribe to this option, CCC will not be held responsible for any injuries or accidents that may occur during the trip. Walking shoes or hiking boots, sunscreen, bug repellant, sunglasses and personal items such as medications, toiletries and a change of clothes. WARM jacket or sweatshirt is needed as it's cooler on the wall than in the city. When you hike your bags will be transported in the bus. Use a knapsack to carry your things for overnight and the hike the next morning. You may bring snacks to eat while walking on the wall however we will give you some as well.